This beautiful contemporary style pedestal table is available in a 42" diameter, 48" diameter and 54" diameter with up to three 12" extensions. Choose to have this handcrafted by an Old Order Amish woodworker in your choice of oak wood, cherry wood, brown maple wood or quarter-sawn white oak. The table has leg levelers in case your floors happen to be uneven. Please call one of our helpful Amish furniture specialists with questions or for ordering assistance. You won't find better customer service then DutchCrafters! The Amish Woodbury Single Pedestal is sure to become a treasured family heirloom! 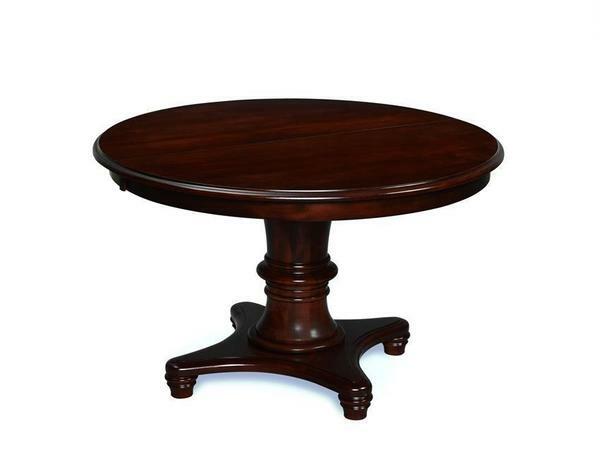 If you are looking for a larger table then check out our Amish Woodbury Double Pedestal Table. Height from floor to bottom of skirt: 26 1/2"